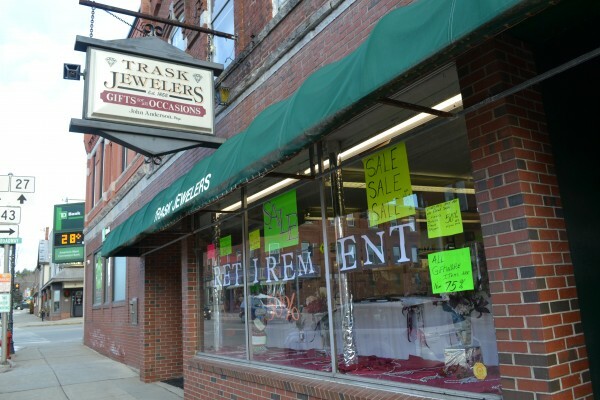 Trask Jewelers on Main Street is closing on Dec. 31, after 159 years in Farmington. John Anderson, proprietor of Trask Jewelers is retiring and closing up shop on Main Street. FARMINGTON - Trask Jewelers is closing its doors forever. For 159 years downtown, the jewelry store has long been considered a permanent fixture with its elaborate window displays and friendly service at good prices. Although he will miss his many customers, now is the time to retire, said the store's proprietor, John Anderson. 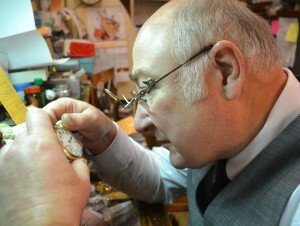 After 40 years at the store that offered jewelry, gifts and a fix-it shop specializing in the increasingly rare watch repair service, Anderson, who grew up in the store his father Paul Anderson owned, will close up shop on Dec. 31. The store also employes two longtime clerks. The shop first opened when Franklin Pierce was president and Abraham Lincoln would still be in Illinois for another 5 years, John Anderson noted. The store was established in 1855 by J.A. Blake who opened it on lower Broadway where WKTJ is now located. An advertisement for Blake Jewelry Store circa 1925. It would go on to become Trask Jewelers. 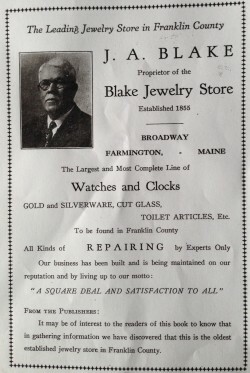 By 1925, Blake Jewelry Store was advertised as "the largest and most complete line of watches and clocks" and its motto was "A square deal and satisfaction to all." 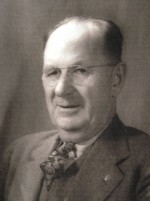 In 1928, L.G. Trask bought Blake's jewelry store and changed the name to Trask Jewelers. Ten years later, the store moved to Main Street where the current Bangor Savings Bank is located. 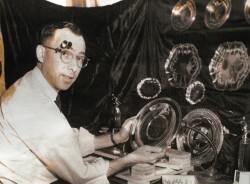 In 1955, Anderson's father, Paul, bought Trask Jewelers. "My father never changed the name. He said, 'the door swings pretty well, we'll leave it alone,'" John Anderson remembers. In 1975, the store moved across Main Street to its current location. John Anderson remembers at age 7 "pushing a broom" to clean the store's floor and by age 9 he was engraving pieces. At 22, he returned to Farmington after college and went to work at the store with his father. He bought the business from his father in January of 1981. In 1928, L.G. Trask bought Blake Jewelry Store. In all, only five people-two sets of fathers and sons-have owned the store over all those years. "It's been a good life. We made a good living," Anderson said quietly. He is proud that he kept costs low for his customers. "We tried to run the business so the people of Franklin County could afford it. Others would charge more but the people around here couldn't afford it." He noted the shop is "still a 19th century store and we use 19th century values." An antique hand-crank cash register still gets the job done, as do the pencils he prefers to use. After working some 60 hours a week for 40 years, Anderson is looking forward to having more time to spend with his 95-year-old father, who lives in Florida and still has the steady hand to do a little jewelry repair on the side. John Anderson's father, Paul Anderson, who owned Trask Jewelers from 1955-1980, engraves trophies for Sugarloaf Mountain in 1960. "I want to slow down, catch up with projects, do a little traveling," John Anderson said, and have time for his Model T Ford passion. He may consider starting a part-time jewelry repair business on the side, like his father does. With lettering taped across the storefront that reads "retirement," and discounts of up to 75 percent off, customers are lined up at the front door waiting for the 9 a.m. opening these days. Anderson will be looking for tenants to occupy his store's space in the spring. "It's bittersweet; seeing this place close," Anderson said looking out across his store. "People tell me this place is an institution because it's always been here." You will be missed, Mr. Anderson! I've found so many perfect gifts in the shop over the years, and enjoyed knowing that I could always pop in if I needed a repair. I wish you the best in retirement, and thank you for your many years of service to the community. Have fun filling up the free hours! John, we wish you the best of luck in your retirement. So sorry to have John retire. He is 11 days younger than me and we have been friends forever. Know that Paul will be delighted to have some company in the warmer winter weather in Florida. Best in the future. I have always enjoyed your shop, John, and the services you have offered. My husband said when he heard you were closing, "Who will replace the batteries in my watches now?" I know we will find someone, John, but I always appreciated you being able and willing to do that chore. Thank you. John, I must say it was a pleasure working for you, I will miss the jokes and political conversations. May you have a wonderful relaxing retirement and enjoy spending time with your dad in much warmer weather. Beth, my partner in crime, may you have a blast relaxing after putting in such dedication (20 years), enjoy traveling and just doing nothing. To both John & Beth, thank you both for everything you did for me, it means a lot and goes along way. I really enjoyed working with both of you. I miss you both ALOT !!! Good Luck !!!!!!!!!!!!!!!! Sad to see that it's closing but it is understandable, I still have what they called an I'D bracelet that my older sister bought me for Christmas in the 60's . Enjoy your retirement, John. My best wishes to you John. May your next venture be bright and shiny. Enjoy. Hey Jack! Envy your ability to retire. Let me know where I can reach you for watch and jewelry repair. Wishing you all the best! Hey Jack! It's time to leave the work to younger, less experienced and less able people. Faith and I are glad you're joining us in the ranks of the retired. I highly recommend it! PS - Someone may have to print him a copy of these nice sentiments. He won't be checking because being on-line to John means "talking on the telephone." .... too bad for Farmington, good for John. I always loved stopping bye and looking for nice gifts in his store! Retirement well deserved - enjoy it! John, I wish you all the best in retirement. January 1st will be the first day of the rest of your life, live it well! So sad to see Trask's closing. Truly the end of an era!. Enjoy your retirement! One of the few remaining places in town where quality always existed and customer service was always found. We all will miss you, but I highly recommend retirement. Sorry someone won't keep the store going though. So sad to see a local business closing. You're work and prices were amazing. Thanks for all the years you put into the business. Enjoy your retirement! So sorry to see John close. My wife and I bought our Wedding Rings from John's father Paul back in 1969 when he was across the street. Good Luck to you John. .
Jack is one of the greatest by all means. Though he never touted it in the interview or has otherwise been rather modest about it, he was President of the Model T Association of America for three years a decade ago. About 35-years ago he helped establish the still vibrant 4th of July Parade (for a number of years before that we didn't have one) and he's been very active in the Henderson Memorial Baptist Church. Hope he will continue with these and many other missions in the years ahead. So sorry to see the store close! Best wishes on your retirement. Wishing I knew something about the business to keep this iconic business around. So sad to see yet another piece of the past disappearing into the future. As an old car buddy, that (Those) Model T will be better for the move, but Downtown Farmington sure will miss this friendly crew. I haven't seen anyone above mention Jack's great voice on WKTJ way back when. Thank you for all you've done. As Paul mentioned, the extra curricular activities many times go unnoticed. No matter where we go in Model T Circles, The Mainly T Tour is always a topic of conversation. My very best wishes to you. Oh, Jack. I will miss you. I have always loved being in your store and have appreciated your great service. Too bad another father with a young son hasn't come forward with another good offer to buy the business! Hope you continue to search. You might even try out of state. I often hear folks say they'd love to move to Maine, but were reluctant because of the long difficult winters they've heard about from ex-Mainers. I always tell them that winters are not really that bad in Maine, especially if you have children. I share with how wonderful it was growing up in Maine. I spent more time outside playing in the winter than I did in other seasons. There was SO MUCH to do in winter ! I am sure you'd be willing to do a bit of teaching about the business and about our beautiful and supportive state. Jack- you are way too young to retire! But I hope you enjoy having more time outside of work. So sad to see Trask Jeweler's closing. I have a number of item my parents bought me there back in the 70's, that I still use. Excellent quality and affordable. Farmington is losing an institution! Wow, what a milestone! Congratulations, Jack, on your many years of service to the community. So many of us are grateful for your lovely selection of items, expert engraving and repairs, and friendly atmosphere... always delivered with uncommon integrity. As I recall from high school, you've been planning this retirement for a long time. So I guess you ride off to your adventures and pass our memories to us "like an orange to a child." Enjoy and know you're in our hearts always. Having grown up with Trask Jewelers as being the place to buy something really special, it is indeed bittersweet to see it go. Only a few months ago I was in Farmington and bought ring guards there for my mother who at 95 is very frail and has lost so much weight that she needed the guards. My mother, by the way worked for many years at another Farmington institution, Howard's Rexall Drugs which was across the street and later next door to Trask. Great that Jack is moving on to another phase of his life.